Differentials are basically drivetrain gears which enable the various drive wheels of a single axle to spin at varying speeds. In case you don’t know, drive wheels receive power that is generated from the internal combustion engine. If there were no differentials, then the drive wheels would receive the same amount of power and rotate at the same speed. On the other hand, when there are differentials installed, the drive wheels can rotate at different speeds. This ensures the vehicle can be driven safely. You may wonder why this is important. Well, it becomes useful when you go to turn the vehicle. They provide a smoother turning experience which reduces the risk of accidents and turnovers, especially when turning at a fast speed. All vehicles have differentials in them. Some vehicles may have rear differentials and others may have front differentials. In some cases, the differentials will exist in the front and rear of certain model vehicles. The differentials and engine have a lot in common. One of their biggest similarities is they both need lubricating fluid to sustain their operation. This lubricating fluid is oil, although it is a different type of oil than what you put in your engine. In some cases, you use different types of differential fluid for the front differential and rear differential. 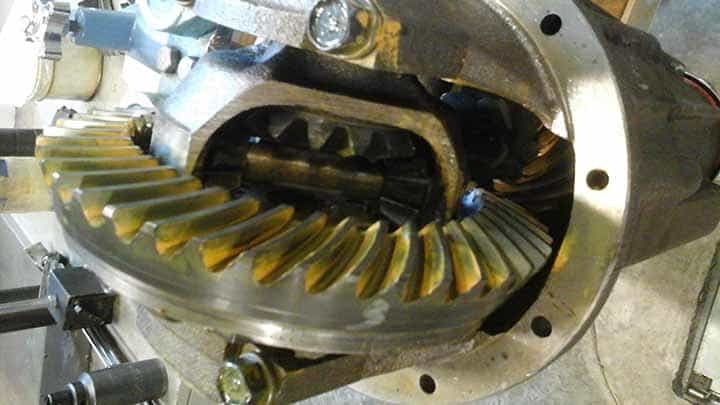 This usually occurs when a front differential has a transaxle installed. It is recommended that fully synthetic oil is used for the front differential and a very thick oil is used for the rear differential. Otherwise, the front differential and rear differential can use the same type of oil if there is no transaxle. Differential fluid changes need to be made periodically for both the front and rear differentials. This is the same concept as when you need to change your engine oil. The only difference is that you don’t change the differential fluid every 5,000 or so miles. You can wait a lot longer for changing the front and rear differential fluids. The car manufacturer’s guide should tell you the exact number of miles you need to drive before you should change your front differential fluid. On average, this fluid should be changed every 25,000 miles that you drive your vehicle. Sometimes it will be a little bit more in the 30,000-mile range but check the manufacturer’s guide to make sure. They will know better than anyone else. If your vehicle has a transaxle and front and rear differentials, then the front differential fluid may need to be changed a lot sooner than 25,000 miles. In fact, you may be looking at changing it every 15,000 to 20,000 miles. During the fluid changing process, you will need to have the transaxle replaced as well. This means you will have new front differential fluid and a new transaxle installed at the same time. The fluid of the rear differential won’t need to be changed as frequently as the front differential fluid. The recommendation of some car manufacturers is that you change your rear differential fluid every 30,000 miles or so. However, there are a lot of car manufacturers that say you can wait until 50,000 miles before you change this fluid. This means you’ll probably end up changing this fluid either once or twice throughout the time you own your vehicle. If you regularly get oil changes at your local car dealership or other lube service facility, they won’t normally remind you about when you need to get your front and rear differential fluids changed. It will be up to you to keep track of the mileage and know when it is the right time. Of course, you can wait until your differentials start malfunctioning but then you’ll end up having to pay to replace them. That will be even more costly than having to replace the fluid. So, be sure to get the differential fluids changed at the appropriate times.